Following up on Al Gore’s reception of the Nobel Peace Prize, Carolyn Washburn of the Des Moines Register asked the Republican candidates several questions on the issue of "global climate change" and related topics. At the beginning of the debate, Washburn stated "we won't talk a lot about issues like Iraq or immigration. They're important issues, no doubt, but Iowans say they know where the candidates are coming from on those." But Washburn gave no indication that Iowans actually wanted to hear more about the Republican candidates’ stance on climate change. The discussion on "global climate change" during the debate, which aired on all three 24-hour cable news channels, began near the bottom of the 2 pm Eastern hour. Washburn, prompting for a show of hands, asked who agreed that "global climate change is a serious threat and caused by human activity." Fred Thompson objected and said, "I’m not doing hand-shows today." Washburn then asked Thompson for a yes or no answer to her question. Thompson asked for a minute to answer, and was promptly denied by Washburn. After Thompson again refused to give an answer, Mitt Romney asked for 30 seconds to give a reply. Again, Washburn denied the request. After repeating her question one more time in a failed attempt to get a show of hands, Washburn directed the question to John McCain, who seemed to be willing to give an answer. McCain said he believed that "climate change is real," and offered a motivation for the adoption of "green technologies." Washburn then prompted Rudy Giuliani for an answer, who said he "agreed with John," but parsed it a bit by saying, "Climate change is real. It's happening. I believe human beings are contributing to it." Washburn directed her next question to Romney. "What impact on the economy would be acceptable in order to reverse global warming and greenhouse gas emissions?" Romney focused on investing in "new technologies to get ourselves off of foreign oil," in order to "help both the environment and the economy and national security." Washburn then prompted Keyes to answer the question, who instead focused on "the betrayal of our sovereignty," among other things. Instead of asking the rest of the candidates for an answer to her initial question, Washburn went on to the related "green" topic of biofuels. She asked Mike Huckabee if he was willing to increase government mandates for biofuel use. The former Arkansas governor didn’t think that was necessary. Washburn then directed the question to Duncan Hunter and Tom Tancredo. Hunter pushed incentives for biofuels over mandates, as well as incentives for other alternative energy sources. Tancredo, whose answer ended the discussion of "green" topics, replied that he was opposed to increasing government mandates. CAROLYN WASHBURN: I want to take on a new issue. I would like to see a show of hands. 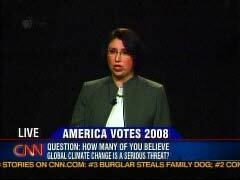 How many of you believe global climate change is a serious threat and caused by human activity? THOMPSON: I'm not doing hand-shows today. WASHBURN: And so, does that mean -- is that yes or no for you? Do you believe that global climate change is a serious threat and caused by human activity? THOMPSON: Well, you want to give me a minute to answer that? THOMPSON: Well, then I'm not going to answer it. MITT ROMNEY: How about 30 seconds? THOMPSON: You want a show of hands. I'm not giving it to you. WASHBURN: We're going to follow up on that, but what I need to know is: Who believes global climate change is serious and caused by human activity? And then we'll talk in more detail about it. WASHBURN: I'm going to start with Senator McCain and come back to Mayor Giuliani. MCCAIN: I've been involved in this issue since the year 2000. I have had hearings. I've traveled the world. I know that climate change is real. But let me put it to you this way. Suppose that climate change is not real and all we do is adopt green technologies, which our economy and our technology is perfectly capable of. Then all we've done is given our kids a cleaner world. But suppose they are wrong. Suppose they are wrong and climate change is real and we've done nothing. What kind of a planet are we going to pass on to the next generation of Americans? It's real, we've got to address it, we can do it with technology, with cap and trade, with capitalist and free enterprise motivation. And I'm confident that we can pass on to our children and grandchildren a cleaner, better world. DUNCAN HUNTER: He said contributing, but not totally. WASHBURN: Let me come at it this way. Let me come at it this way. What impact on the economy would be acceptable in order to reverse global warming and greenhouse gas emissions? Governor Romney? ROMNEY: Well, it's going to help our economy because we're going to invest in new technologies to get ourselves off of foreign oil. And as we get ourselves off of foreign oil, we also dramatically reduce our CO2 emissions. That's good for the environment. It's also good for our economy. Because buying $300 billion or $400 billion worth of oil a year from other people who use it against us, that's bad for our economy. It's also bad for the environment. We can do these things in a way that help both the environment and the economy and national security. That's the beauty of what we're talking about here, which is, yeah, is global warming an issue for the world? Absolutely. Is it something we can deal with by becoming energy independent and energy secure? We sure can. But at the same time, we call it global warming, not America warming. So let's not put a burden on us alone and have the rest of the world skate by without having to participate in this effort. It's a global effort. But our independence is something we can do unilaterally. WASHBURN: Mr. Keyes, what do you think about this? ALAN KEYES: Well, what I think is that a lot of folks out there ought to understand that what you're watching represents the situation in our country. Ask yourself who represents the people they don't let you hear from. And you'll know who you should vote for in the Iowa Caucuses. Who represents the voice that they're absolutely determined to overlook in the discussion of our sovereignty and the betrayal of this people's sovereignty, on the border, on our moral principles, on the major export overseas, which is our jobs. These folks represent the very elite who year, after year, after year, have destroyed our Constitution, betrayed our rights, and undermined our strength created by our people in the world. THOMPSON: I agree with Alan Keyes' position on global warming. KEYES: I'm in favor of reducing global warming. I think the most important emission we need to control is the hot air emission of politicians who pretend one thing and don't deliver. WASHBURN: Let me come back -- let me come to a question that Iowans may not let you out of answering. Governor Huckabee, you've said you support increasing government mandates, requiring motorists to use 36 million gallons of biofuel by 2022, which is six times what we're producing this year. Are you willing to increase that mandate, even if it will drive up feed for livestock producers or force consumers to buy flex-fuel vehicles? WASHBURN: So are you willing to increase the mandate? HUCKABEE: I am willing for us to make the decisions which will not necessarily create the mandates. And let me tell you how we do it. You know who one of the biggest energy users is in the whole country? The United States government. If the government commits to being the primary user of alternative forms of energy, we have a market built in and, therefore -- the big argument against having alternative energy is there's no market for it. Let the government be a marketplace, and we'll create the kind of demand that lowers the price rather than raises the price. HUNTER: You know, I'd say, instead of mandates, incentives. The problem with mandating only biofuels -- and you know, ethanol is not the greatest thing in show business. You use a lot of energy to create ethanol and there's other biofuels out there -- biodiesel, etc. But by giving incentives in R&D, and by bringing our government laboratories together with business, with our educational institutions, the United States can become the center with a grand new industry of energy innovation. We can be the leaders in the world in this. But you don't want to push away things like hydrogen fuel cells and others things. Incentives is the way to go, and we should take the entire array of alternative energy sources and give incentives to private enterprise to get involved, to get into the business of delivering us a great product. And we can produce a great new industry for this next generation. WASHBURN: Congressman Tancredo, what would you do about mandates? TOM TANCREDO: No, I don't believe in mandates. I don't believe that they should be increased. I believe that the market is the best determinant of exactly how these problems should be addressed. I don't mind and I would not be opposed to any investment in research and development. But the idea that the government knows the right amount somehow, some way, some brilliant analyst, usually some politician who hasn't the slightest idea of the issue, will make a decision about what is the right amount of mandate to impose on the rest of the country. And you know what? It never works out right. Let the market -- I trust the market more than I do the government.